"Pitaya" usually refers to fruit of the genus Stenocereus, while "Pitahaya" or "Dragonfruit" always refers to fruit of the genus Hylocereus. The Pitaya is more commonly referred to as the dragon fruit. It is an extremely beautiful fruit that has dazzling flowers and an intense shape and color. 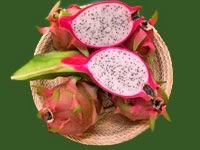 The dragon fruit is usually a dark red color, although some types of this fruit are pink or yellow. 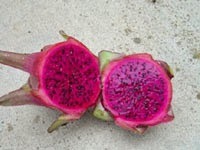 The skin of the dragon fruit is a thin rind. 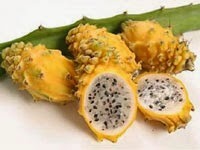 The skin is usually covered in scales, and the center of the fruit is made up of a red or white, sweet tasting pulp. Three types of Dragon fruit species. After thorough cleaning of the seeds from the pulp of the fruit, the seeds may be stored when dried. Ideally, the fruit must be unblemished and overripe. Seeds grow well in a compost or potting soil mix - even as a potted indoor plant. 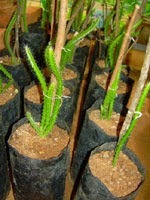 Pitaya cacti usually germinate between 11 and 14 days after shallow planting. As they are cacti, overwatering is a concern for home growers. As their growth continues, these climbing plants will find something to climb on, which can involve putting aerial roots down from the branches in addition to the basal roots. Once the plant reaches a mature 10 pounds in weight, the plant may flower. 2. Seedlings Seeds can be used to produce seedlings. But, commercially not in used. Because it takes long period as well as it can not continue characteristics of mother plants. Obtain cuttings from the selected mother plants. 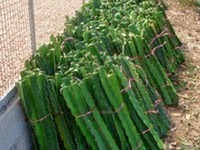 15 20 cm cuttings are used for planting. Pile up these cutting 1-2 days prior to potting. Then these cuttings are potted with planting mixture. Keep these pots with shade place to rooting. These rooted cuttings are acclimatized before planting infields. Planting space is about 2 x 2m. Pit size is about 60 x 60 x 60cm. These pits are filled by top soil, decomposed cow dung or compost with 10og of super phosphate. To improve the drainage, add small brick pieces and some amount of sand to bottom of the pit. 0 Response to "Dragon Fruit - Hylocereus undatus Cultivation"